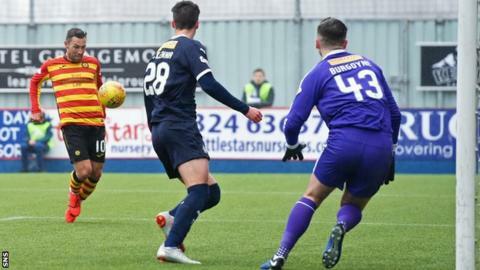 Falkirk and Partick Thistle shared the points for the third time this season in the only Championship fixture to survive Saturday's weather. The visitors went ahead after just 10 minutes through Scott McDonald. But Falkirk equalised just before half-time when Ian McShane slid in his third goal of the season from close range. Despite further chances at either end, neither side could find a winner, so Falkirk stay eighth, one point ahead of Thistle, who have a game in hand. Falkirk manager Ray McKinnon: "It was a frustrating result, but there were some nerves out there given the magnitude of the game. "The standard wasn't where it should have been for both sides. Being at home, we are probably looking at it as two points dropped, but it is still just one defeat in nine." Partick Thistle manager Gary Caldwell: "That was frustrating because we played better than Falkirk and should have been more than one goal in front before losing a sloppy goal. Match ends, Falkirk 1, Partick Thistle 1. Second Half ends, Falkirk 1, Partick Thistle 1. Attempt saved. Lewis Kidd (Falkirk) right footed shot from outside the box is saved in the centre of the goal. Ross MacLean (Falkirk) wins a free kick in the defensive half. Aaron Jarvis (Falkirk) wins a free kick in the defensive half. Foul by Jack McMillan (Partick Thistle). Substitution, Falkirk. Lewis Kidd replaces Deimantas Petravicius. Substitution, Partick Thistle. Gary Harkins replaces Blair Spittal. Corner, Partick Thistle. Conceded by Paul Dixon. Attempt missed. Scott McDonald (Partick Thistle) right footed shot from the centre of the box is too high. Substitution, Partick Thistle. Aidan Fitzpatrick replaces Lewis Mansell. Corner, Falkirk. Conceded by James Penrice. Substitution, Falkirk. Aaron Jarvis replaces Davis Keillor-Dunn. Substitution, Falkirk. Ross MacLean replaces Ian McShane. Corner, Falkirk. Conceded by Steven Saunders. Corner, Falkirk. Conceded by Sean McGinty. Foul by William Edjenguele (Falkirk). Miles Storey (Partick Thistle) wins a free kick on the left wing. Corner, Partick Thistle. Conceded by Ciaran McKenna. Jordan McGhee (Falkirk) wins a free kick on the right wing. Paul Paton (Falkirk) is shown the yellow card for a bad foul. Substitution, Partick Thistle. Miles Storey replaces Joe Cardle. Attempt missed. Scott McDonald (Partick Thistle) header from the right side of the six yard box is too high. Scott McDonald (Partick Thistle) wins a free kick in the attacking half. Attempt missed. Ian McShane (Falkirk) right footed shot from the centre of the box misses to the left.